The following is a key to insect larvae feeding internally in apple fruit. Characters have been compiled from several sources (given below). Several morphological terms should be reviewed. Caterpillars have six true, jointed legs on the thoracic segements, immediately behind the head. The remaining, abdominal segments have various arrangements of prolegs (fleshy lobes used for grasping). These prolegs have small hooks, or crochets. These crochets may be arranged in a row of hooks of equal length (uniordinal), alternating long and short hooks (biordinal), or alternating long, medium and short hooks (triordinal). When a caterpillar or grub is viewed face-on, there are some sutures or lines on the face that form an inverted "Y". The central area between the arms of the "Y" is called the frons; the area just forward of this region is the clypeus. High magnification is required to examine these structures. ..........VINEGAR OR POMACE FLIES, Drosophila spp. Ahmad, M and H. R. Burke. 1972. Larvae of the weevil tribe Anthonomini (Coleoptera: Curculionidae). Misc. Publ. Entomol. Soc. Am. 8: 31-81. Brooks, F. E. 1924. The cambium curculio, Conotrachelus anaglypticus Say. J. Agric. Res. 28: 377-386. Chapman, P. J. & S. E. Lienk. 1971. Tortricid fauna of apple. N.Y. State Agric. Exp. Stn. Spec. Publ. 122 p.
Garman, P. 1918. A comparison of several species of Lepidoptera infesting peach and apple in Maryland, with additional notes on the oriental peach moth. Md. Agric. Exp. Stn. Bull. 223: 103-126. Howitt, A. H. 1993. Common Tree Fruit Pests. Mich. State Univ. Ext. NCR 63. 252 p.
MacKay, M. R. 1959. 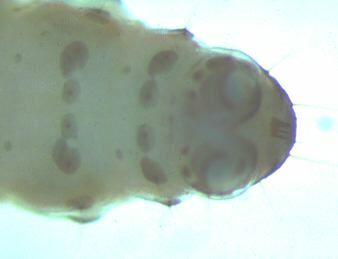 Larvae of North American Olethreutidae (Lepidoptera). Can. Entomol. 91 (Suppl. 10): 1-338. Stehr, F. W. (ed.) 1987. Immature Insects. vol. 1. Kendall Hunt, Dubuque. 754 p.
Stehr, F. W. (ed.) 1987. Immature Insects. vol. 2. Kendall Hunt, Dubuque. 974 p.